This show will include all member artists. 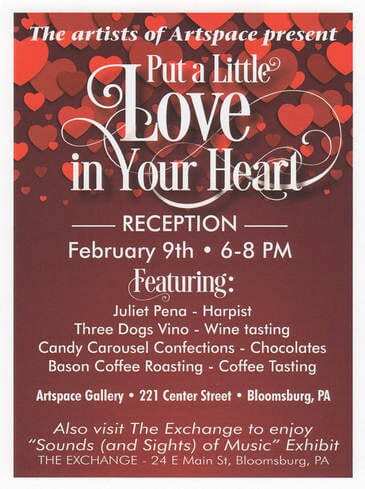 The reception will be a chocolate, coffee, and wine tasting event featuring Three Dogs Vino and Bason Coffee Roasting. Julia Pena will provide beautiful harp music – to add to the magic of this special evening! A nice way to share time with your Sweetheart the weekend before Valentine’s Day! Reception: February 9, from 6:00 pm to 8:00 pm.